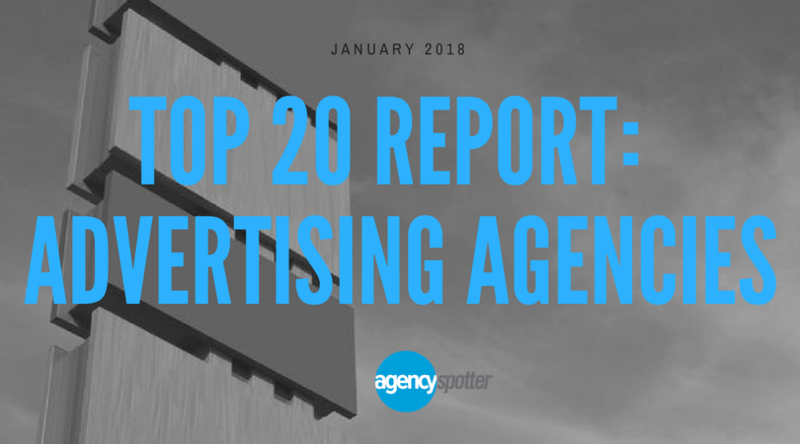 ATLANTA, GEORGIA, January 23, 2018	(Newswire.com) - ​Agency Spotter releases the Top Advertising Agencies Report for January 2018. The report features the top 20 advertising agencies out of a pool of more than 2,300 advertising agencies. Brokaw, out of Cleveland, Ohio, occupies the the top advertising spot this January. Their work for brands like Sbarro, vitaminwater, GE, Hilton, hotels.com, and many more helped them rise to the top along with a portfolio of 12 outstanding projects. The effectiveness of the Cleveland-based agency is evidence of a growing trend: marketing in the midwest. Brokaw playfully states they are at "the center of the [advertising] universe," citing AdAge with the quote "move over 72andSunny... here comes 26andOvercast." Learn more about Agency Spotter's methodology to rank agencies or check out more top agency reports on Agency Spotter.